This course ranks #2 against all reviewed courses. Justin Bennett’s Daily Price Action course discusses most of the ‘typical’ aspects about price action trading. When we say ‘typical’, we mean not much different from the Jonathan Fox or Nial Fuller courses. 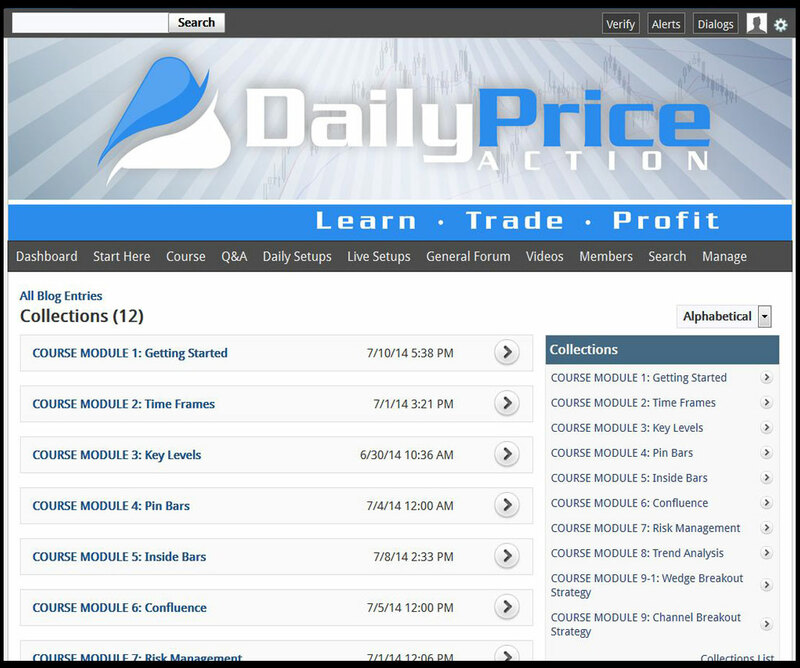 The course consists of 9 modules with each module discussing a specific segment about price action. Justin explained each concept with the help of graphical illustrations and practical examples (where required). The last lesson was uploaded in the premium section on July 30th 2014. However, Justin left a message in the last lesson saying “Coming Soon: I will be adding more lessons over time.” So apparently he plans to add more, but nothing for the last 4 months. The course is undoubtedly decent quality content. Premium members could learn price action fundamentals with graphical illustrations and practical examples. The quality of the content is on par with the courses spoken above, but doesn’t separate itself in any unique way. There are no quizzes in the course to test the students understanding of the course material. There is a Q&A section. Members can post queries about any lesson in the relevant section and the queries are answered by Justin himself. The course basically consists of nine modules. The coach Justin Bennett tried to cover the typical mainstays to price action trading and money management rules. In this chapter, Justin highlighted the significance of five-day charts. He explained, with the help of examples, how an incorrect chart (having Sunday candles) may ruin your technical analysis. Here the coach teaches you how to set up a chart, i.e. selecting colors for different candles, background and bars. Justin shared a list of 26 currency pairs that he considers best for trading. He also gave some suggestions to newbie traders about the selection of a pair. We did think it was weird he is recommending 26 pairs that beginner traders should watch. We felt this was a bit overboard since most beginner traders cannot effectively monitor so many pairs. The second module is all about choosing timeframes. In this chapter, Justin explains the significance of only using higher timeframes, which we felt put him into a specific ‘camp’ of mentors teaching the same thing. Here Justin took a look on commonly used justifications for using smaller timeframes such as “I don’t have enough money to trade the higher time frames”, “Trading higher time frames is boring”, etc. We didn’t find any compelling reasons here, but felt it was an honest attempt. 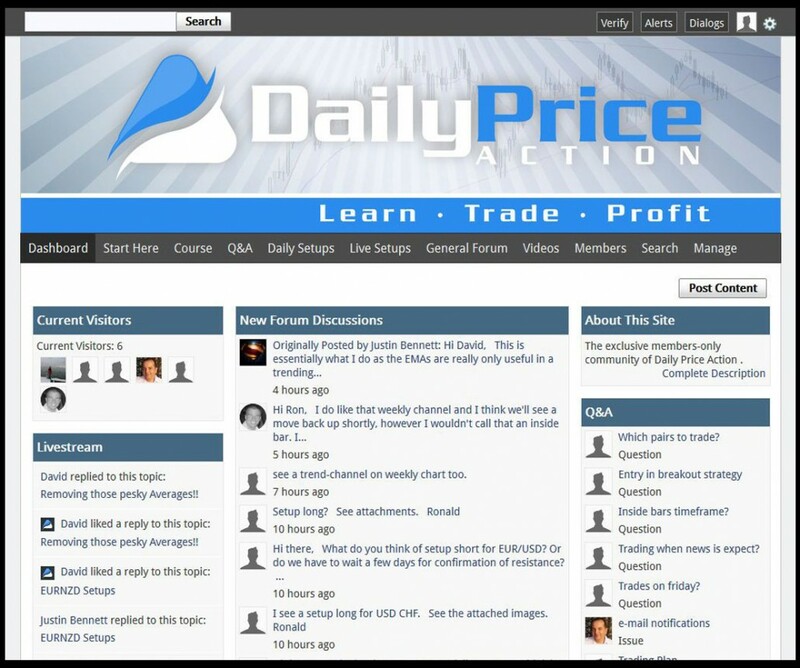 This module talks about identifying daily levels with the help of various price action methods. In this lesson, Justin teaches a technique about using weekly pin bars for daily key levels. The lesson also consists of a short video. The mentor explains how moving averages can be used to identify dynamic support and resistance levels. The lesson covers everything about moving averages. He does use the same moving averages as Nial Fuller (from Learn to Trade the Market), but also adds a few more. In this lesson, Justin touches on swing analysis and how price action approaches a level, but there is not much depth here. This lesson consists of two videos in which Justin demonstrated various methods for identifying key horizontal support and resistance levels. In this lesson, Justin teaches the characteristics of qualified pin bars with the help of a graphical illustration. Here the coach explains methods for entering and exiting the market while trading pin bars. He showed everything with the help of good graphical illustrations. Justin explains the importance of trend lines in price action trading and how trend line breaks can provide useful PA info. In this lesson, Justin graphically explains the features and characteristics of valid inside bars. This lesson covers the rules that should be followed while trading the inside bar trade setups. The rules are explained with the help of examples and graphical illustrations. In this lesson, Justin explains how to trade inside bar setups. He illustrated various entry and exit strategies with the help of charts. In this short module, Justin covers everything about the confluence levels and their effectiveness in price action trading. The following are the two detailed lessons included in this module. In this lesson, Justin discusses the combination between price action and confluence and how to use it. Here, Justin explains the main confluence factors that should be considered before deciding whether a trade setup is of any worth or not. This lesson describes the importance of risk-reward ratio and how to figure it out for a particular trade. In this lesson, Justin elaborated on the concept of proper risk to reward ratio with the help of different case studies. Here Justin teaches how to use various timeframes while identifying a trend for potential trade setups. In this lesson, the coach explains how a trend can be identified visually just by analyzing swing highs and swing lows. This lesson states what a measured move is and how you can use it to predict future moves in a price pattern, although we’ve seen little evidence to support the concepts. In this lesson, Justin teaches how to trade a wedge break. The lesson contains a short video that practically demonstrates the wedge trading. We really didn’t find much difference here than is typically found in any google search. 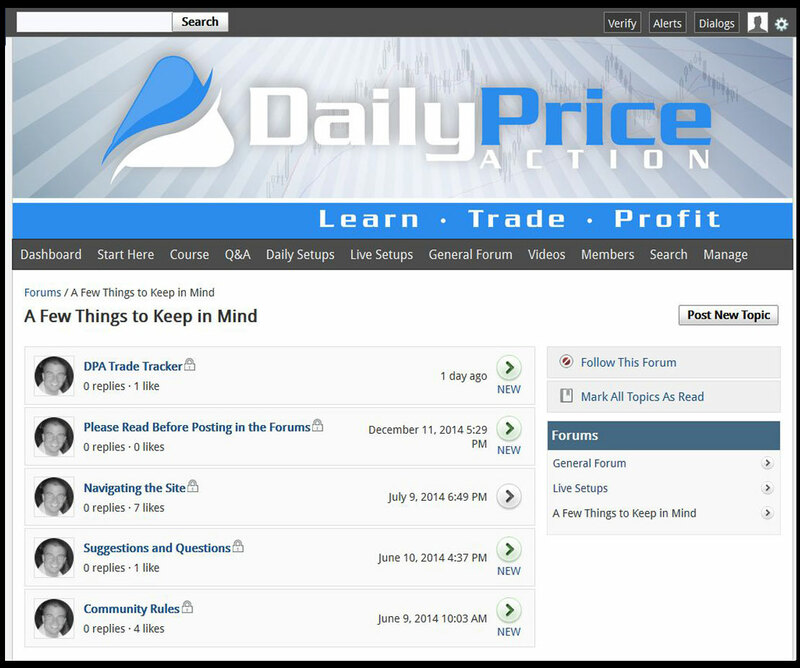 There is a section in the members zone where members can get recent trade setups shared by Justin himself. 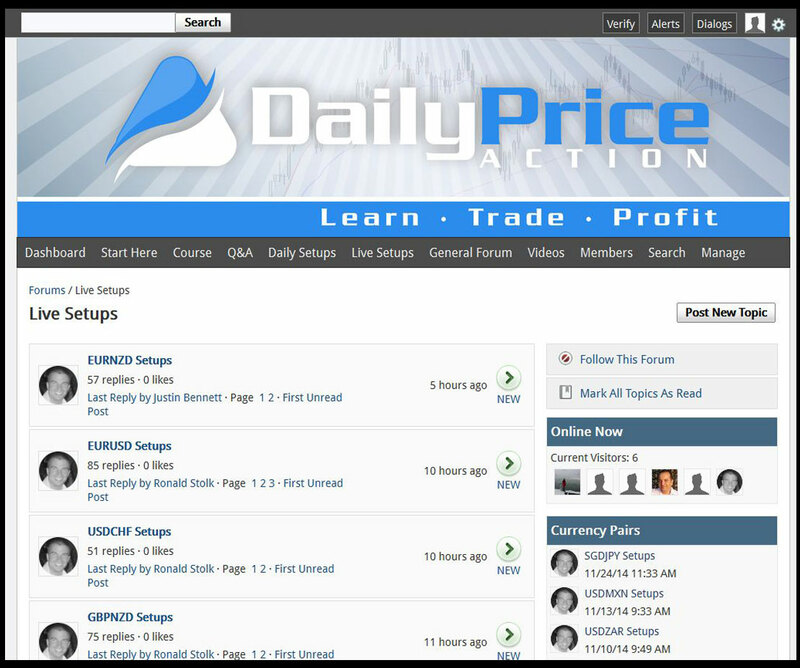 The section contains trade setups on various currency pairs and commodities. In this section, anybody can share trade setups. This is basically a members-only discussion forum. Justin also participates in the live trade forum, but mostly commenting on the students setups. 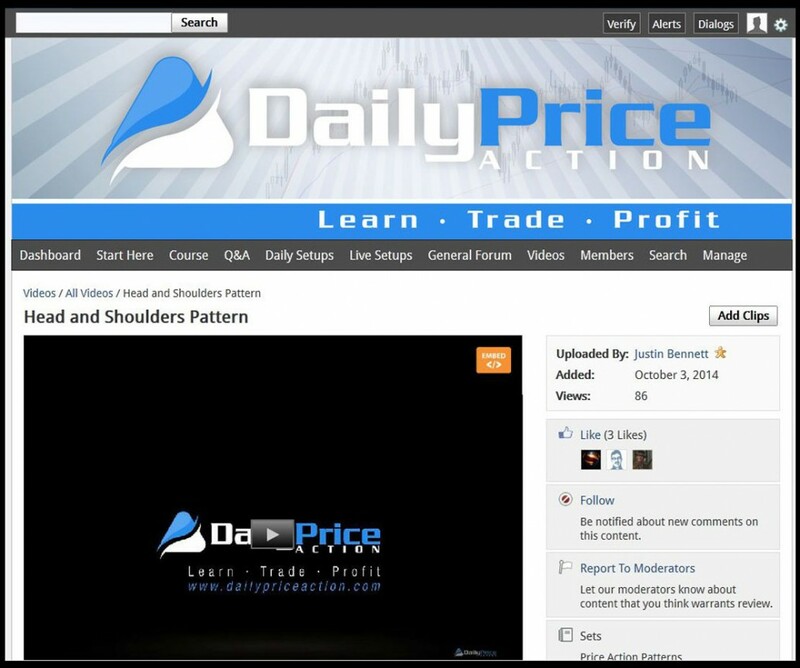 In the video library, premium members can gain access to many video lessons about different price action topics and practical trading illustrations. Justin did seem cordial and willing to answer questions, and is generally commenting several times a day to answer questions. The layout of the course is decent, although, we felt it could use some improvements, but a ‘B’ effort for sure. Other than the discussion on measured moves and wedge breaks, we didn’t find much to separate Justin Bennett’s material from most of the other price action courses out there. Overall we have to put Justin Bennett in the category of what you see in the other ‘standard’ price action course formats, whereby they only teach higher time frames, inside bars, pin bars, & the only difference being wedge breaks and measured moves. You won’t find many new ideas in here, but if you are looking for a course teaching these basic PA things, we feel this an acceptable option. We gave a 7/10 rating for being decent, having nothing ‘bad’, but also not having anything special or singular.